Childhood immunization protects children from a variety of serious or potentially fatal diseases. World health organization (WHO) study has shown that 2.5 million deaths occurred every year as a result of vaccine-preventable diseases, mainly in Africa and Asia among children less than 5 years old. The WHO started the expanded program on immunization in 1974, against six most common childhood preventable diseases, Childhood tuberculosis, polio, diphtheria, pertussis, tetanus (DPT), and measles. In Libya, the National Program of Vaccination has been notably successful, achieving high immunization coverage rate. It provides vaccines for all children against 13 diseases-free of charge. The vaccines included in the national vaccination schedule are bacille Calmette Guerin, inactivated and oral polio vaccines, DPT vaccine, measles-mumps-rubella, hepatitis B vaccine, hemophilus influenza type b vaccine, Rota virus vaccine, meningeococcal vaccine, and pneumococcal vaccine. Previous studies have shown that uptake of vaccination services is dependent not only on the provision of these services but also on many factors, including knowledge and attitude of parents, the density of health workers, accessibility to vaccination clinics, availability of safe needles and syringes and the opportunity costs.,, Therefore, the present study was carried out to assess the Parental factors affecting childhood immunization in Benghazi to recommend interventions that increase immunization coverage rate of the children. A descriptive, cross-sectional study was conducted on all Libyan parents of children aged from 2 to 18 months old and who had attended the Maternal and Child Health (MCH) clinic at Al-Hadaeq health center in Benghazi to vaccinate their children during the period from November 1, 2016 to January 31, 2017. Data were collected using pretested questionnaire. The questionnaire was divided into four parts: demographic data of parents and children, parents' awareness of the national vaccination program, immunization status of the children, and reasons of parents for delaying child's immunization. Data were entered and analyzed using IBM SPSS Statistics (statistical program for the social sciences) for Windows, Version 23.0. (Armonk, NY, IBM Corp., released 2015). for calculating the numbers, the percentage and Chi-square test, using the level of significance P < 0.05. A total of 419 parents agreed to participate in the study. Their mean age was 30.90 ± 8.30 years (range 18–56 years). Mothers constitute 79% of the study population, and 53% of the children were male. Majority of the parents 402 (96%) knew the role and timing of the national vaccination program in protecting children from some infectious diseases [Table 1]. The common source of information about child immunization between parents was the health workers (61%) followed by the family (18%). 86% of the children were completely immunized for their age, whereas 58 children (14%) were partially immunized. Chi square test showed a significant association between the child's immunization status and the following variables: age and gender of parents, parents' education, parents' awareness of child's immunization, and marital status [Table 1]. Analysis of the demographic characteristics of the parents participated in this study showed that the mothers constituted most of the sample and this is similar to other studies conducted in Saudi Arabia  and poland. More than half of the parents had higher education, and almost all the parents were aware of the national compulsory vaccination program regarding timing and its benefits. Health workers were the common source of information about child immunization between the parents. 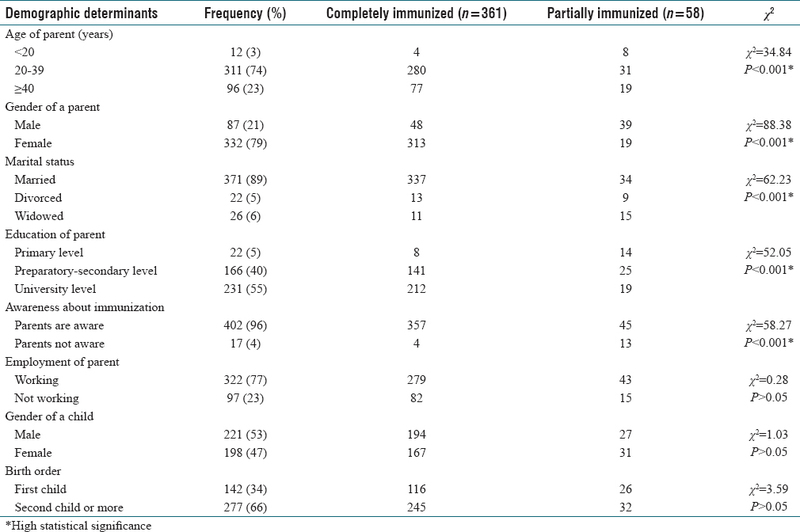 This study study did not observe unimmunized children, in contrast to other studies in India  and Pakistan  which reported 23.9% and 30% of children, respectively, were not immunized at all. Partial immunization was observed in 14% of our sample indicating that still there were some children lost to follow up and missed some vaccines. The percentage reported in this study for complete immunization (86%) was higher than the coverage rate reported in several studies in Elbeida city-Libya  India, Pakistan, and Nigeria. The main reason of parents for delaying child immunization in this study was because of unavailability of vaccines in MCH clinics followed by child sickness and forgetfulness, in contrast to other studies,,, where the child sickness was the main reason. Unavailability of vaccines in MCH can be explained by logistic causes due to the war. In agreement with many studies , mothers were positively associated with complete child immunization status and this can be explained by mothers are always used to accompany their children to immunization visits, and communicate more with the health providers, so more aware and concern of child immunization status. Furthermore, married parents affected positively the immunization status of the child as shown in other studies., While in contrast with many studies parent's working status had no effect on the child's immunization status.,, Gender of the child and birth order did not significantly affect the state of immunization in the present study, and this is similar to Nigerian study. The limitation of the present study that it was conducted on Libyan parents attending one health center in Benghazi, therefore the obtained results cannot be generalized to the parents in all the country. Although almost all the parents in this study were aware and had good knowledge about the national vaccination program for children, there are still some children missed vaccinations. More educational interventions are needed to increase and update parents' knowledge, and more emphasis on the local health authority is needed to ensure continuous vaccines supply to all MCH clinics and health centers in Libya. The author would like to express her appreciation and gratitude to all the parents who participated in the study and colleagues who helped in the conduct of the study. Global Immunization Vision and Strategy (GIVS). Geneva: WHO/ UNICEF. Available from: http://www.whqlibdoc.who.int/hq/2005/WHO. [Last accessed on 2017 May 15]. Expanded programme on immunization (EPI). The social science and immunization research project. Wkly Epidemiol Rec 1998;73:285-8. World Health Organization. WHO Vaccine Preventable Diseases Monitoring System. Available from: http://www.apps.who.int/immunization_monitoring/en/globalsummary/countryprofileselect.cfm. [Last accessed on 2017 May 15]. Matsumura T, Nakayama T, Okamoto S, Ito H. Measles vaccine coverage and factors related to uncompleted vaccination among 18-month-old and 36-month-old children in Kyoto, Japan. BMC Public Health 2005;5:59. Torun SD, Bakirci N. Vaccination coverage and reasons for non-vaccination in a district of Istanbul. BMC Public Health 2006;6:125. Anand S, Bärnighausen T. Health workers and vaccination coverage in developing countries: An econometric analysis. Lancet 2007;369:1277-85. Yousif MA, Albarraq AA, Abdallah MA, Elbur AI. Parents′ knowledge and attitudes on childhood immunization, Taif, Saudi Arabia. J Vaccines 2013;5:215. Rogalska J, Augustynowicz E, Gzyl A, Stefanoff P. Parental attitudes towards childhood immunisations in Poland. Przegl Epidemiol 2010;64:91-7. Nath B, Singh JV, Awasthi S, Bhushan V, Kumar V, Singh SK. KAP study on immunization of children in a city of North India: A 30 cluster survey. OJHAS 2008;7:2-10. Nisar N, Mirza M, Qadri MH. Knowledge, attitude and practices of mothers regarding immunization of one year old child at Mawatch Goth, Kemari town, Karachi, Pakistan. Pak J Med Sci 2010;26:183-90. Bofarraj M. Knowledge, attitude and practices of mothers regarding immunization ofinfants and preschool children at Al-Beida City, Libya 2008. Egypt J Pediatr Allergy Immunol 2011;9:29-34. Odusanya OO, Alufohai EF, Meurice FP, Ahonkhai VI. Determinants of vaccination coverage in rural Nigeria. BMC Public Health 2008;8:381. Management Group, Medical Center, Birla Institute of Technology and Science (BITS), Pilani. Maternal knowledge and perceptions about the routine immunization programme – A study in a semi urban area in Rajasthan. Ind J Med Sci 2003;57:158-63. Impicciatore P, Bosetti C, Schiavio S, Pandolfini C, Bonati M. Mothers as active partners in the prevention of childhood diseases: Maternal factors related to immunization status of preschool children in Italy. Prev Med 2000;31:49-55. Bonanni P, Bergamini M. Factors influencing vaccine uptake in Italy. Vaccine 2001;20 Suppl 1:S8-12. Chhabra P, Nair P, Gupta A, Sandhir M, Kannan AT. Immunization in urbanized villages of Delhi. Indian J Pediatr 2007;74:131-4. Strobino D, Keane V, Holt E, Hughart N, Guyer B. Parental attitudes do not explain underimmunization. Pediatrics 1996;98:1076-83.